Table 1: Commercial composites recycling services. Table 2: Near commercial composites recycling services. Glass and carbon fibres are inherently energy intensive to produce and resins used in composites are almost all oil-derived. The 'composite' nature of these materials and the predominantly cross-linked matrices used are what give them such excellent properties, but at the same time make them difficult to recycle. Seeking to gain as much value as possible from production and end of life waste is a quest worth pursuing, but it is a quest which a great many have embarked upon and few have reached the goal. 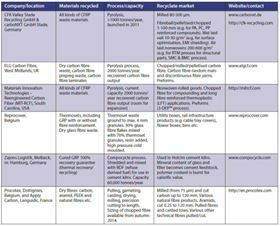 Table 1 lists the companies of which the author is aware who, at the time of writing, are taking waste from the composites industry and recycling it into marketable products. Table 2 lists several companies which are close to this position. No doubt there are more, in addition to a good number of companies recycling in-house or in business to business relationships. 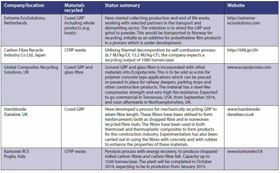 For example, M-C-R, part of Groupe Plastic Omnium, have been recycling their clients' GRP waste as filler back into moulding compounds for many years. This article celebrates those who have reached the goal and, though they may still be growing and developing, are commercially recycling composite materials. Here are the stories of two such companies. I first met John Davidson, then Managing Director of Milled Carbon, in 2007 at a WINGNet meeting (a network for waste reduction in aircraft). At that point they had developed their first pilot scale pyrolysis plant in the West Midlands, UK, and were soon to become the world’s first commercial carbon fibre recycling company. Milled Carbon changed name to Recycled Carbon Fibre in 2008 and was bought by ELG Haniel GmbH in 2011, becoming ELG Carbon Fibre (ELG CF). Davidson’s career has been in carbon fibre manufacture and since moving on from Recycled Carbon Fibre in 2009 he works as an expert in manufacture of carbon fibre and PAN precursors through his company, Carbon Fibre Technologies International. “When we first started recycling carbon fibre composites we hadn’t anticipated the level of success we came to achieve,” says Davidson. They acquired a second hand annealing furnace which they modified to suit their purpose. After mixed results to start with, they quickly learned the ideal parameters required to achieve their goals. With the process proved in principle, the next challenges appeared. One was to identify the properties of the recyclate and this was solved by their introduction, through WINGNet, to Boeing which was exploring a means to close the lifecycle on their new Dreamliner. Boeing had the material tested at North Carolina State University and the findings were far in excess of what they had hoped for. Next they needed a continuous source of carbon fibre waste. This had been a concern from the beginning. This in itself led to the problem of knowing what was in the waste and trying to educate waste generators about what they could and could not take – an ongoing problem which all recyclers face. Though in this case, they also had to deal with the secretive nature of the industry. Most composites manufacturers do not want to reveal how they made the composite. Overriding all this was the need to comply with environmental regulations. This was particularly difficult because the authorities did not know how to deal with this new process and simply didn’t understand what happens when you burn composite resins, the environmental impact and how to monitor and regulate the process. This was a major headache throughout. Davidson speaks of trying to navigate the environmental laws of the time as a nightmare. It wasn’t until Milled Carbon/ Recycled Carbon Fibre moved to new premises in 2008 that they finally received a licence to operate. But it did not end there. Alex Edge, current Business Development Manager at ELG Carbon Fibre, explains how they had to work closely with local authorities, the Environment Agency and the Health and Safety Executive to understand the risks of fibres released into the atmosphere in the factory. Initially they took a very conservative approach in terms of respiratory protection and personal protective equipment (PPE). 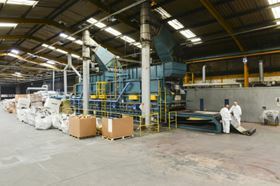 Over time they have monitored parts per million of fibres in the air and, with effective extraction units and isolation of milling and shredding rooms, the communal areas are now clean and have very low dust levels. Staff and visitors can safely walk through the factory without suiting up in full PPE. A barrier to development at the Coseley site which ELG CF currently operates is the electricity demand. The shredder and furnace put a high demand on the local grid and investment to improve the local electricity supply infrastructure would be high. While supplies can support the current equipment running at full capacity, ELG CF is assessing ways to generate power using heat recovery from the furnace. They can also avoid using the furnace to process dry fibre waste for the thermoset market, where keeping the size on the fibre surface is useful. From very early on Milled Carbon concentrated on the end uses of the recyclate, collaborating on many government funded projects in an effort to create momentum. In the last year the waste coming in has boomed and the challenge to generate more markets is greater than ever. With aggressive marketing ELG CF could possibly bring in up to 10,000 tonnes of carbon fibre waste per annum, for which they would need three sites. If you know of any other companies to add to our lists please e-mail us at RP@elsevier.com. To do this, ELG CF has worked with OEMs in several sectors who have opened up their supply chains to develop semi-finished products tailored to the market need. These products maintain fibre length as much as possible to maximise the value of the fibres and hit a price point for customers which allows them to make substantial savings over virgin carbon fibre. While not applied to primary structures, for tooling or secondary structures these can displace lower value CFRP applications or improve properties where GFRP has been used. Such products include random mats, discontinuous fibre yarns and preforms. These are already available through toll manufacturers while development continues to meet customer requirements and gain certification, with a view to investing in equipment to manufacture in-house. The recently appointed Managing Director, Frazer Barnes (since February 2014) has decades of experience in introducing carbon fibre in different applications and sectors. His approach is refreshingly open and they recently held an open day with trade association Composites UK which was well received. ELG CF’s story is a success story, though still in the making, with challenges that go far beyond 'simply' creating a process and a supply chain. There is plenty more to do in a market which is rapidly growing and changing. 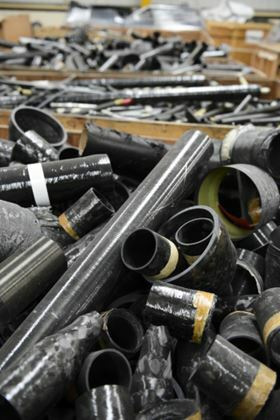 Part 2 of this article outlines the actitivies of Belgian company Reprocover, and discusses further developments in recycling composites.